Ida’s Easy Skillet Apple Pie is just that — easy. Welcome to In The Kitchen with Sharon! This week’s guest is Ida Hecht, the community relations manager at Bell Gardens. Ida is going to share the first pie she ever made. This pie looks delicious! I wish the first pie I ever made looked that good. Unfortunately, it did not. 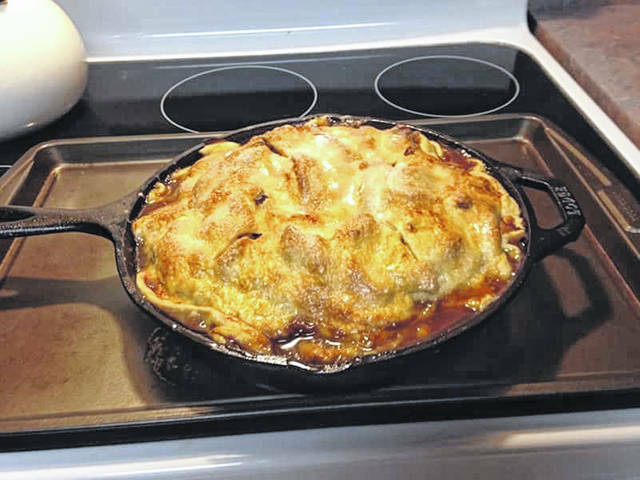 Ida leads a very busy life, so she says, “Lets make it easy.” I am all for easy, so here is Ida’s Easy Skillet Apple Pie. Let’s make this pie! • 2 pounds Granny Smith apples. • 2 pounds Braeburn apples. • 1 teaspoon ground cinnamon. • 3/4 cup granulated sugar. • 1 cup firmly packed light brown sugar. • 1 (14.1-ounce) package refrigerated pie crusts. • 2 tablespoons granulated sugar. Step 1: Preheat oven to 350 degrees. Peel apples and cut into wedges a half an inch thick. Toss apples with cinnamon and 3/4 cup granulated sugar. Step 2: Melt butter in a 10-inch cast-iron skillet over medium heat. Add brown sugar and cook, stirring constantly for one to two minutes or until sugar is dissolved. Remove from heat and place one pie crust in skillet over brown sugar mixture. Spoon apple mixture over pie crust and top with remaining pie crust. Whisk egg white until foamy. Brush top of pie crust with egg white and sprinkle with two tablespoons of granulated sugar. Cut four or five slits in top for steam to escape. Step 3: Bake at 350 for one hour to one hour and 10 minutes, or until golden brown and bubbly, shielding with aluminum foil for the last 10 minutes to prevent excessive browning, if necessary. Cool on a wire rack for 30 minutes before serving. Serve with butter-pecan ice cream. 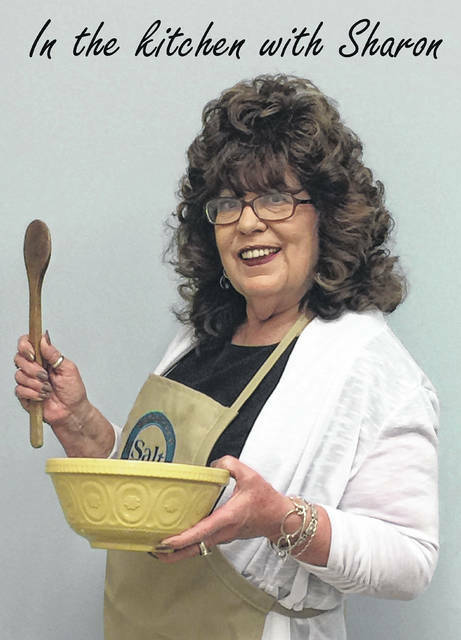 Would any of you like to share a recipe for In The Kitchen With Sharon? If you would, call or email me and I will be glad to get your recipe and a photo of what you are making, and share them with everyone.